Ainsley Vermost visited the U.S. Space & Rocket Center in Huntsville, Alabama. CLEARWATER, Fla. — Reality set in when Ainsely Vermost rounded the corner and saw the nearly 200-foot long space shuttle perched in front of space camp. The welcome shuttle was just the beginning to an incredible week for the Clearwater Central Catholic student. 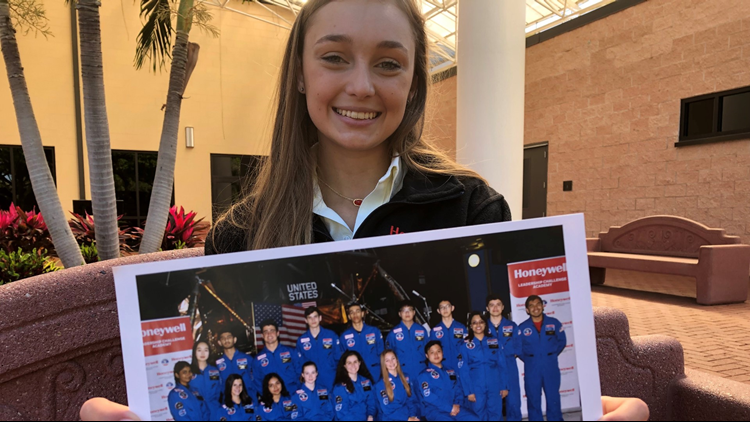 She was one of 292 teenagers to be hand-selected to attend a weeklong camp at the U.S. Space & Rocket Center in Huntsville, Alabama. “Only a couple of us were from the U.S. We had France, China, Canada, India,” listed Vermost, who was one of two CCC students to attend. The camp is sponsored by the Honeywell Leadership Challenge Academy (HLCA). For almost 10 years, HLCA has inspired students (age 16-18) to pursue careers in STEM through hands-on activities, technology and science. Reality set in when Ainsely Vermost rounded the corner and saw the nearly 200-foot long space shuttle perched in front of space camp. Students engage in team-building challenges such as designing, building and testing their own model rockets; participating in simulated astronaut training sessions; coding challenges; shuttle missions; a moonwalk; and performing scientific experiments and other unique activities. The program also includes a rocketry activity to introduce students to computer science, aiming to encourage interest by addressing the coding gap. The camp is open to students of current full-time Honeywell employees around the world. Since its launch in 2010, Honeywell, in partnership with the USSRC, has awarded more than 2,709 scholarships to students.